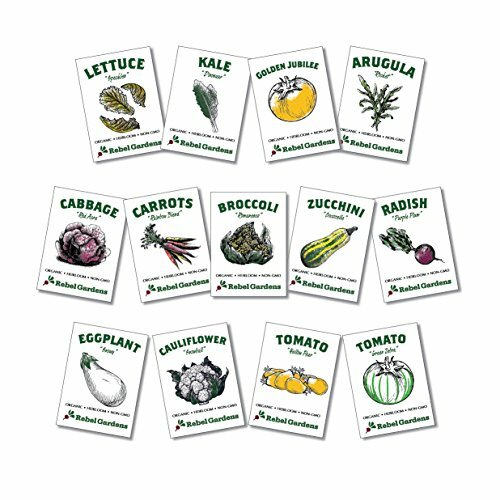 This curated garden seed set is the perfect choice for a gardener looking to grow rare, unique, & different varieties of vegetables. The heirloom varieties in this variety set are not the plants you will typically find in a garden. While kids love to garden, having them plant this set is extra fun. The varieties look weird but still taste great, which means children get to have fun planting, watching them grow, and eating them. This set is also perfect for school gardens. Why grow boring broccoli when you can grow the interesting, fun, and fractal Romanesco broccoli? Join with Rebel Gardens in saying no to GMO's, mono-culture, and our industrialized food system by planting your own seeds & growing the rebellion. CERTIFIED ORGANIC - All seeds are organic, heirloom, and Non-GMO. Grow and eat with confidence that you got the best. A GREAT GIFT IDEA - This fun and funky selection of weird vegetables is a great gift for kids or the gardener who has it all, it is also perfect for school gardens. 100% SATISFACTION GUARANTEE - If anything does not meet your standards let us know and we will make it right. If you have any questions about this product by Rebel Gardens, contact us by completing and submitting the form below. If you are looking for a specif part number, please include it with your message.